Everyone has dreams. Sometimes you wake up remembering them and other times, at least for me, you can’t seem to figure out what was happening during your sleep- and this depends on how deep you are in your sleep. After a recent vivid dream I had, I got to wondering, in what stage of sleep do you dream? Before we slowly begin falling into a slumber we will go through what is known as the Alpha stage and the Theta stage where we have periods of time of dreaminess. This is similar to day dreaming except you are actually falling asleep. During Alpha stage, you could experience lifelike feelings or even hypnagogic hallucinations- which is what the moment before falling asleep is called. For example, you could think you hear a doorbell when in fact it is one of these hallucinations you are having due to sleep. From Alpha you will transfer to Theta. Theta is the sleeping stage in between an awake state and the state where you are truly asleep. This stage will only last around minutes, usually 10 minutes or shorter. When you enter stage two of your sleep cycle you will only be there for about 20 minutes. Your body temperature will drop and your heart rate will slow down. The third stage will have slow but deep brain waves called Delta waves. This is the period when you go from lightly sleeping into your deep sleep. Many people seem to wonder “is dreaming deep sleep related?”. According to How Sleep Works, the dreaming begins to occur in REM sleep which is in fact deeper sleep, and while deep sleep begins during the third stage, dreaming typically occurs later in the sleeping cycles. The fourth stage is often known as Delta sleep due to the delta waves occurring during this time. This stage of sleep will last approximately 30 minutes. Stage five is the deepest point of sleep known as REM sleep. The different stages of sleeping and dreaming all lead to the REM cycle where dreaming actually occurs. The different levels of dreaming will happen when your brain and body enter the REM cycle. The majority of our dreams – especially our most vivid, wild, or even nightmarish dreams, will occur during REM sleep. It is often thought by many sleep experts that muscular atonia that accompanies REM sleep may possibly be a built in measure our minds take in order to protect our bodies from self-inflicted danger, which could possibly occur while physically acting out any dreams happening in REM cycle. According to Tuck, if you are awoken during your REM sleep cycle, you will most likely remember your dreams. During a normal eight hours of rest a night, an individual can experience three to five intervals of REM sleep cycles each night. That has the potential to allow lots of vivid dreams to occur. It is likely that you will not remember all of your dreams but they are happening. Many times, if you are awoken outside of REM sleep cycles, you will not remember any dreaming that has occurred. Do Some People Dream More Than Others? If you have ever wondered why you felt you dreamt more as a child as compared to an adult, you would be correct. Infants and children can spend up to 50% of their time in the REM sleep cycles. In contrast adults will spend nearly half of their sleeping time in the second sleep state while only a small 20% is spent in the deep sleep of REM cycles. The other 30% of the sleeping time is divided among the other three levels of sleep. Unfortunately, as you age, you will begin to spend progressively less time in the deep sleep REM cycles. So enjoy your deep and restful sleeps while you can, as well as your dreams. If you are having trouble remembering your dreams later in the day after you wake up, you could start a dream journal. 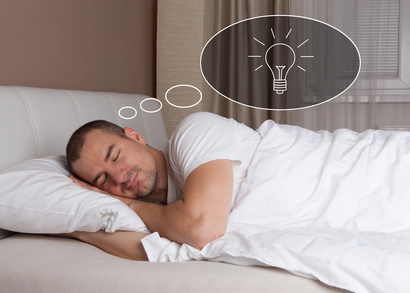 Recording your dreams – if you happen to wake during a REM sleep cycle, can help you remember them. Just be sure to jot down anything you remember as soon as you wake up. This could be useful if you are having any recurring dreams or if you are interested in dream interpretation. Or it could just be a fun hobby. What stage of sleep do you dream? As you lay down to sleep tonight, you will know the answer. The deep sleep cycles of REM sleep will be the gateway to the dream world. While your mind can take you on vivid scenes or wild adventures, that you may or may not remember when you wake up, keep in mind every single night that you have a REM cycle, you will have a dream. Do you have any questions about which stages dreams occur? Comment below and let me know!